Kidō Senshi Gundam Part 1: Gundam Daichi ni Tatsu! is the first story in a Gundam text adventure series for the Japanese PC-88 home computer. It’s old and not well known outside of Japan – in fact, it’s probably obscure even in Japan. 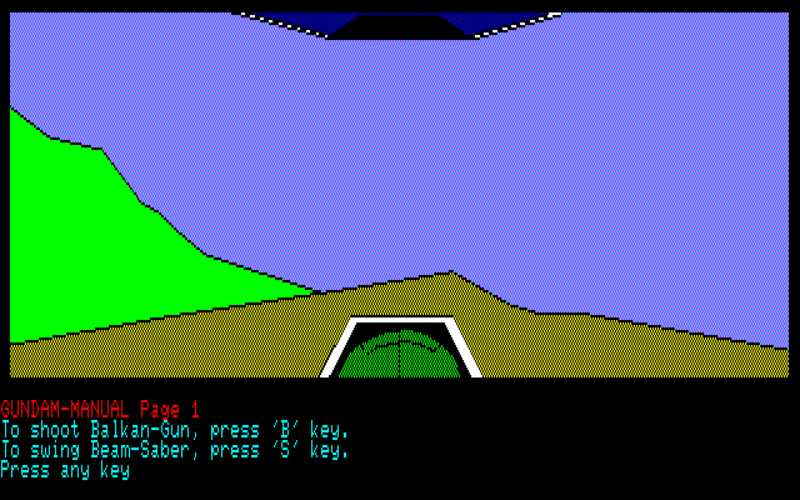 Interestingly, the entire game is in English – all the descriptions are in English and the player has to type everything in English. 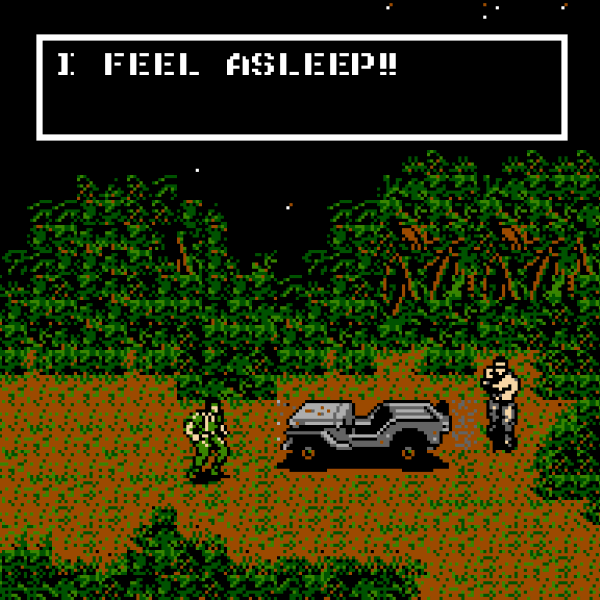 But the game wasn’t developed by or for native English speakers, so there are charming little English mistakes throughout the script. You are in a road. 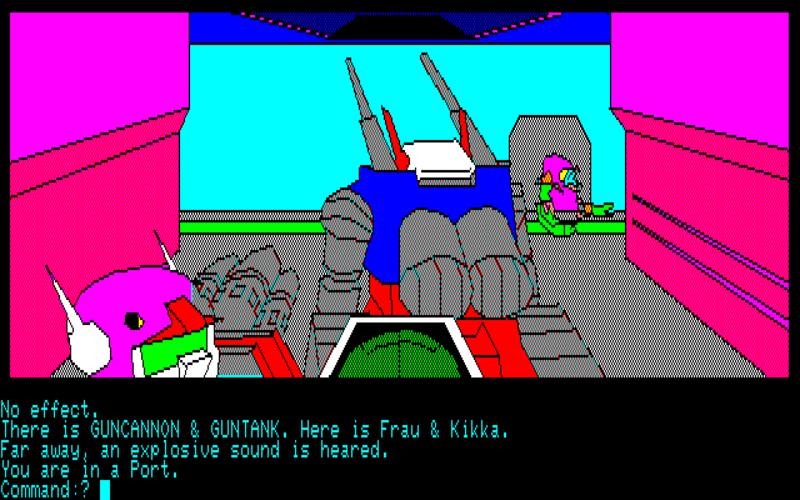 Frau and Haro were blew away by exploding wind. Frau is crying and flurried, because of her mother's death. When you hit FRAU, she was still lost herself. But she reached to the Port. Far away, it seems to be two ZAK. They are rushing to you. What is your instructions? The Bullet are quite empty. But ZAK are getting no damage. SWISH ! ! The ZAK is perished and exploded. You have to think another command. The target is too far to reach the saber. SWISH ! ! 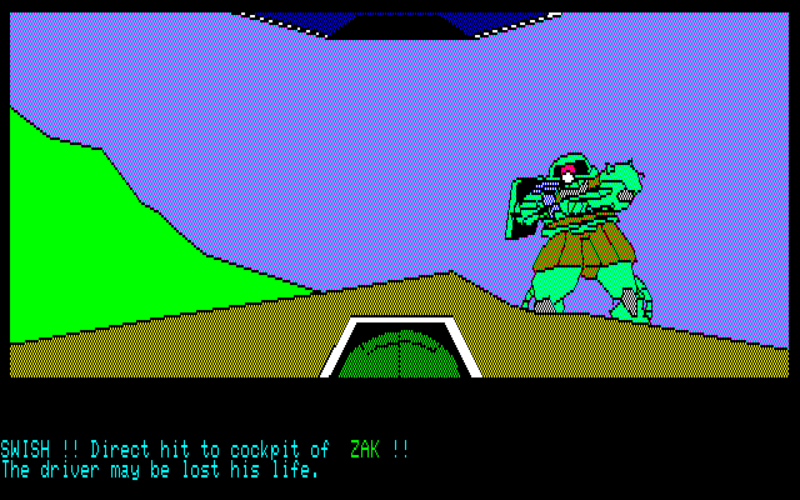 Direct hit to cockpit of ZAK ! ! The driver may be lost his life. Congratulations for complete of your mission. Now is the time half past of this game. Far away, an explosive sound is heared. 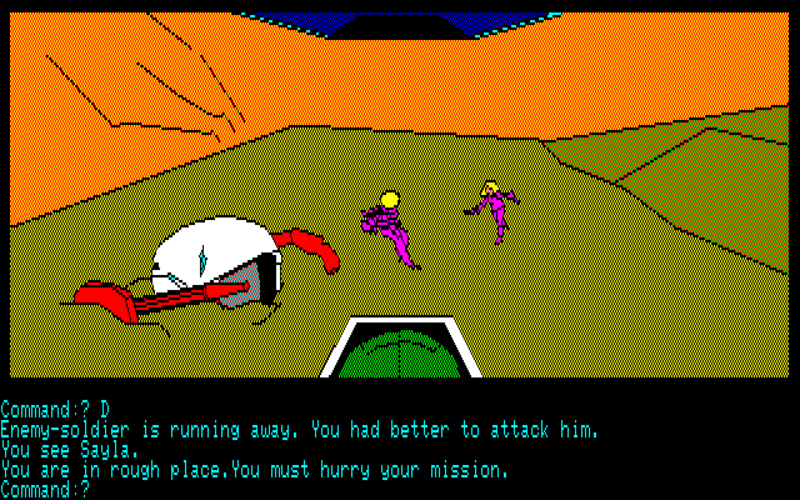 Enemy-soldier is running away. You had better to attack him. Ok. GUNDAM got Sayla in the hand. Ok. There is a Naparme. You are in rough place. 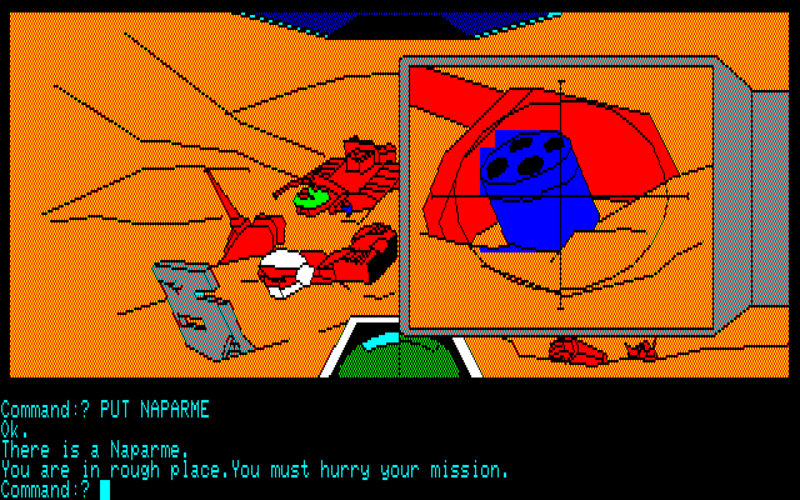 You must hurry your mission. Naparm was exploded, and Mobile-Suit parts were destoryed. 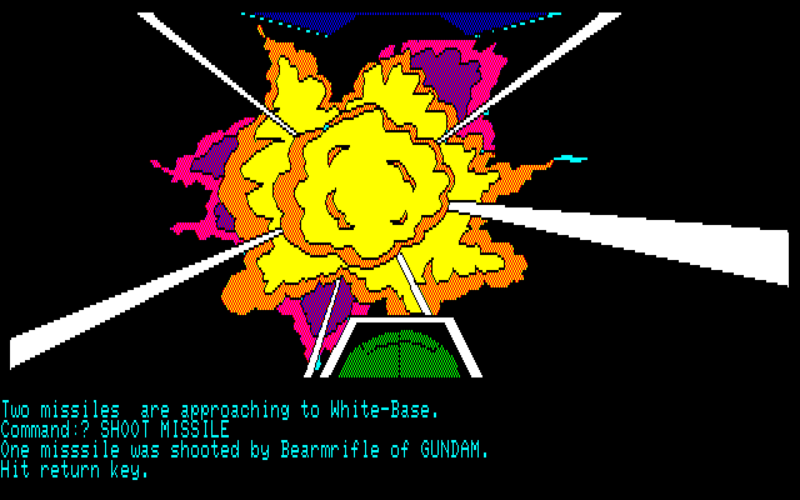 Two missiles are approaching to White-Base. 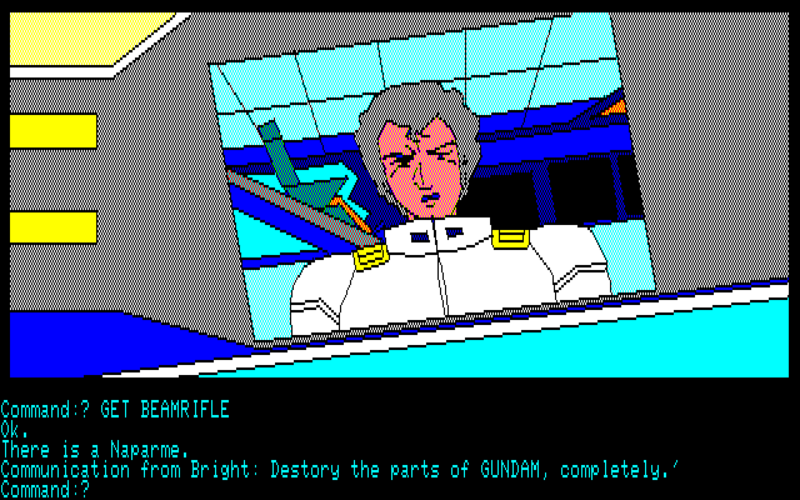 One misssile was shooted by Bearmrifle of GUNDAM. 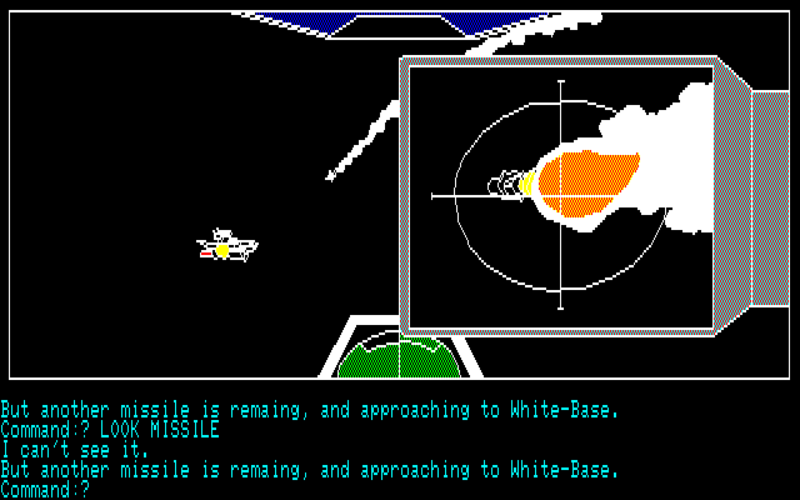 But another missile is remaing, and approaching to White-Base. Two ZAK's are approaching, one is the normal-type, and another is the red-painted: CHAR OF RED COMET'. Please hit return key to go to next round !! 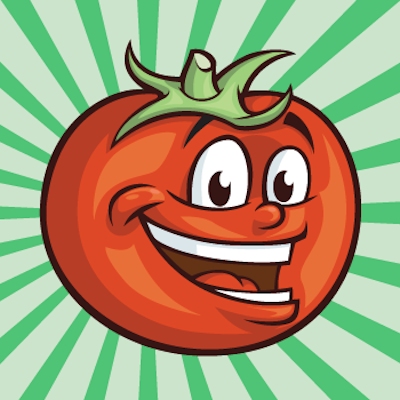 This game has lots of ways to die or fail. I doubt I’ve even found them all, but most seem to have some funny English phrasing. You killed by ZAK. . . . . GAME-OVER. As a result of you abandon Frau, she became a prey to ZAK. She was died. . . . . GAME-OVER. Your saber hit the ZAK and it exploded. The breeze blowed TEM out of side-7. He became a dust of the space. GAME-OVER. G A M E - O V E R ! Oops ! ! Sayla was bounded to the ground. Sayla died. G A M E - O V E R.
Fortunary, first hit was just a scratch. 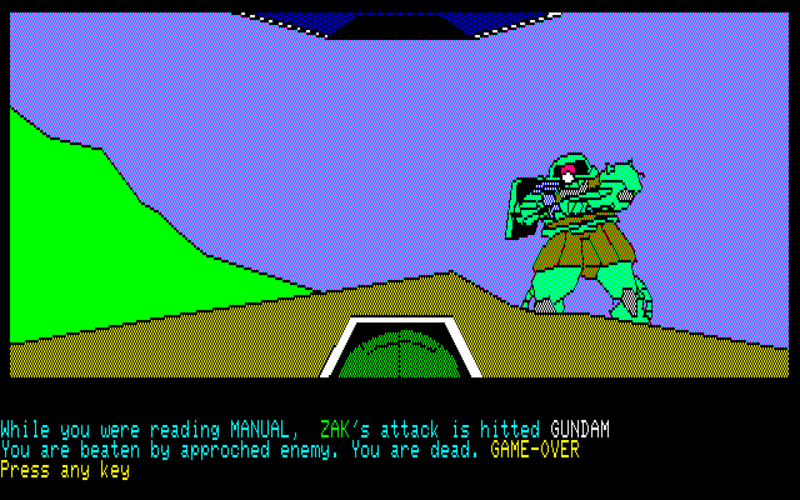 But second was direct hit to the cockpit of GUNDAM. You:AMURO got a death. GAME-OVER. 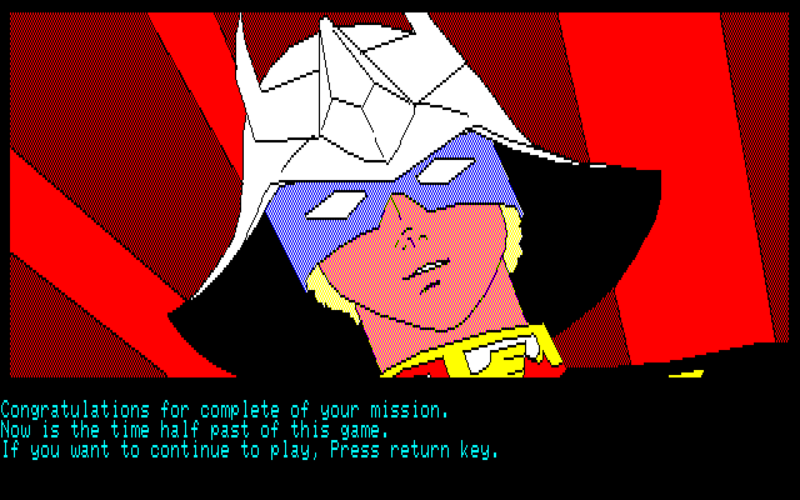 It appears there were going to be at least three games in this Gundam text adventure series, but only one more was made: Kidō Senshi Gundam Part 2: Tobe! 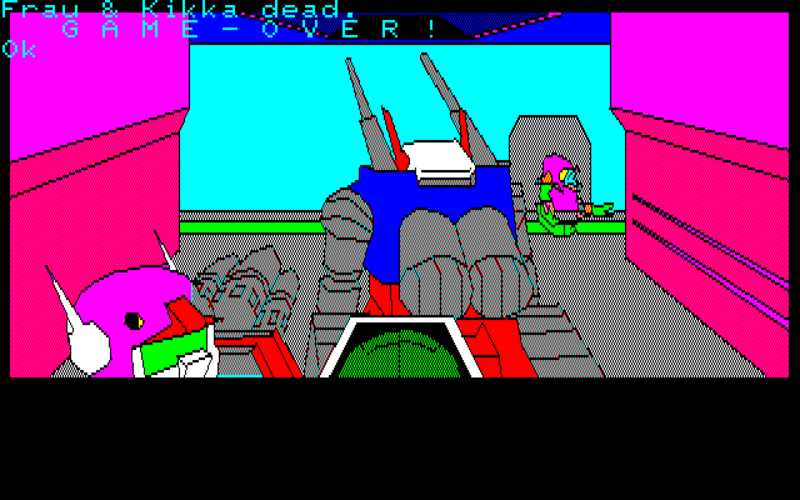 Gundam . 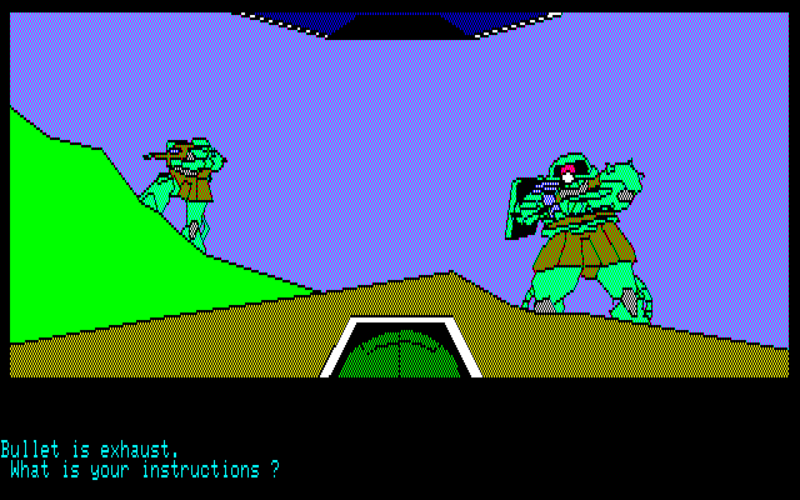 This sequel is also entirely in English, but it has fewer language issues than the first game. Still, if you enjoyed these silly screenshots, check it out sometime! 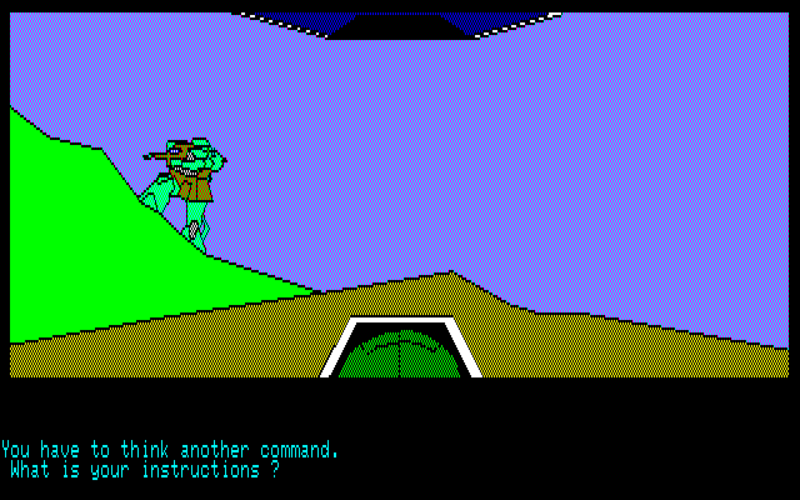 Also, if you liked any of the bad English screenshots above, you'll love my Bad Translation Hall of Fame! And of course this not only predates the 2001 translation of 0079, but I think this even predates the (awful) UK dub of the compilation movies too. 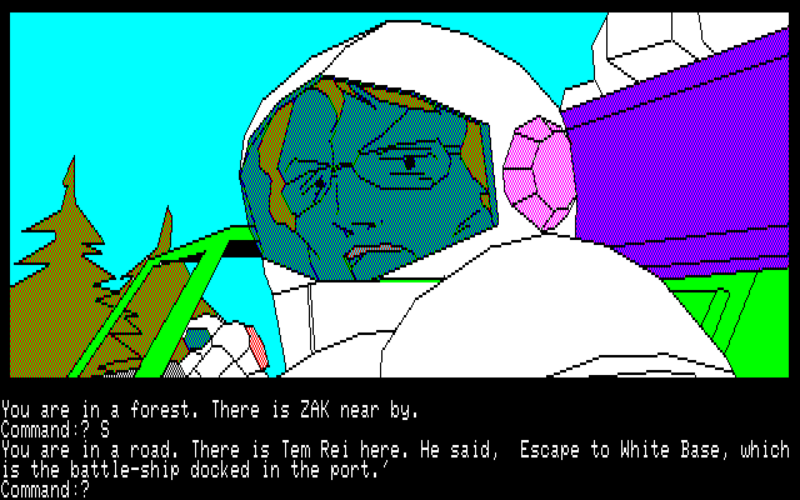 Naturally a lot of the translations are really off from what English fans will expect with Amuro’s surname being “Rei” instead of “Ray” “Zak” instead of “Zaku”, “Faru”instead of “Fraw” (this one is particularly interesting as her name is written フラウ, so it’s not a textbook romanization choice), with both “White-Base” and “Mobile-Suit” hyphenated. Frankly I’m surprised “Sayla” isn’t “Seira” or “Serra” and “Red Comet” is rendered as we know it today (though admittedly the only alternative for translating 赤い彗星 that I can think of is choosing synonyms for red like “Crimson Comet” and I’d hope even whoever translated this had to know it was supposed to evoke 赤い悪魔/Red Baron, or at least didn’t know more complex terms like that.). 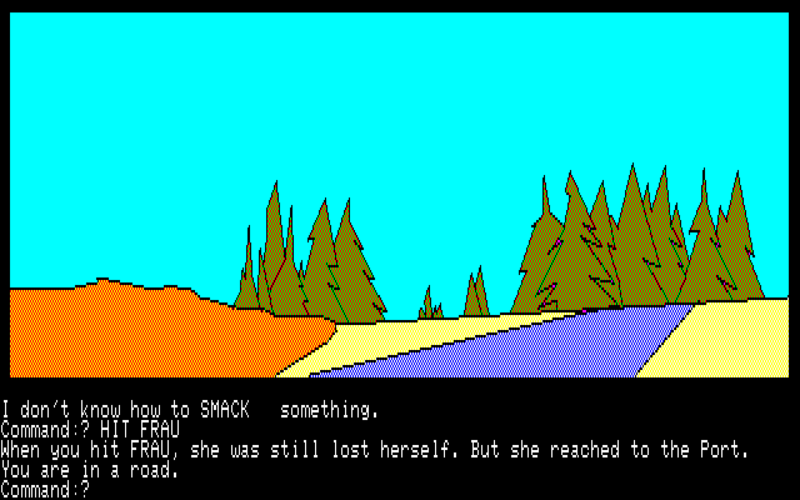 The funniest thing about this article is that the text parser, true to show, expects you to slap Fraw. Any alternate solutions? Did this or the sequel include the famous Bright slap scene? I’m pretty sure that hitting her is the only solution. A walkthrough had to tell me that, I never would have thought of doing that myself! Amuro slapping Fraw out of nowhere to cure her shock in the first episode is pretty famous, though not as famous as the Bright slap. Looking at a playthrough a LOT of the actions seem to a non-challenge if you follow the show’s plot and completely impossible if you haven’t seen it, with slapping Fraw being one of them. The sequel unfortunately doesn’t seem to get to the Bright slap scene (it’s pretty famous in both Japanese and English. “オヤジにもぶたれたことないのに！” shows up a lot in anime, including some weird places like a beach scene in Kiniro Mosaic). A pity, the idea of that scene in text parser and slightly broken English seems hilarious. From the looks of it, the game just adapts the first episode of the series into adventure game format and expects the player to know what to do based on their knowledge of what Amuro did in the episode. Where is she called “Faru”? 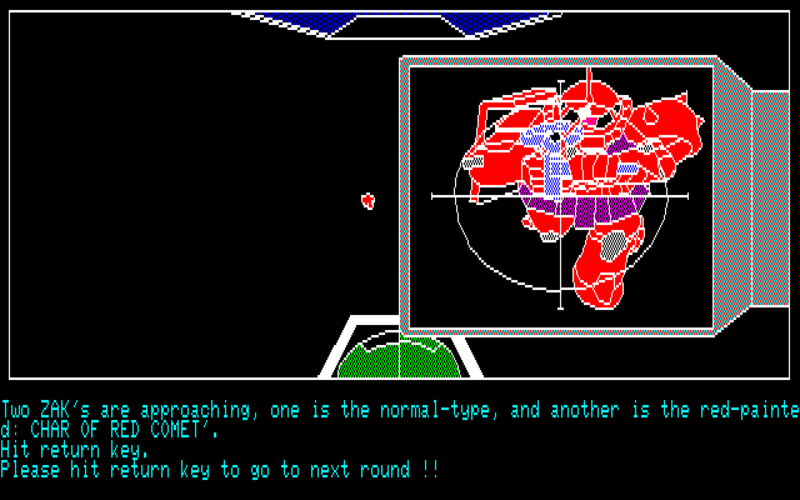 Also, I suspect that CHAR OF RED COMET comes from someone taking 赤い彗星のシャア and mistranslating の as “of”. Just goes to show you, you should never bother reading the manual. You never know when you might get hitted by a ZAK. That caught my eye, too. I was like, whoa, it’s possible to lose this game when you’re still on the way home from the store! Also, don’t you just hate it when you get a death? 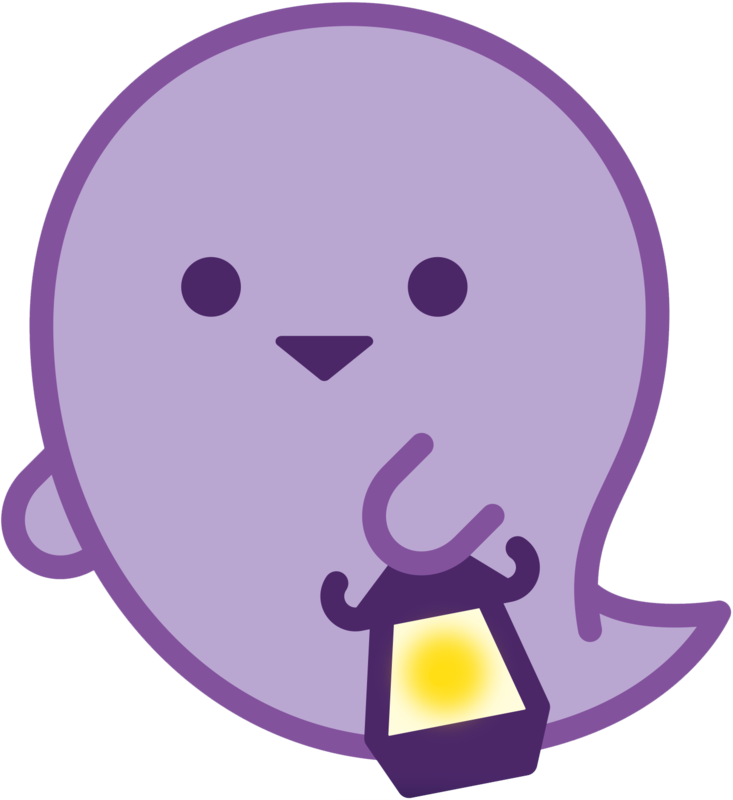 So I’ve figured out that it’s bad to hit a ZAK. But what I don’t know is: what is a ZAK? I can tell it’s an evil robot, but what does “ZAK” actually mean? Not a Gundam fan, I take it? Nah, not me. I think I saw maybe two episodes of one or another of them — 08th MS Team, I think.